The other day I saw a little girl carrying her very own Cabbage Patch doll and it brought such a smile to my face. And the reason why? Well this is the story. 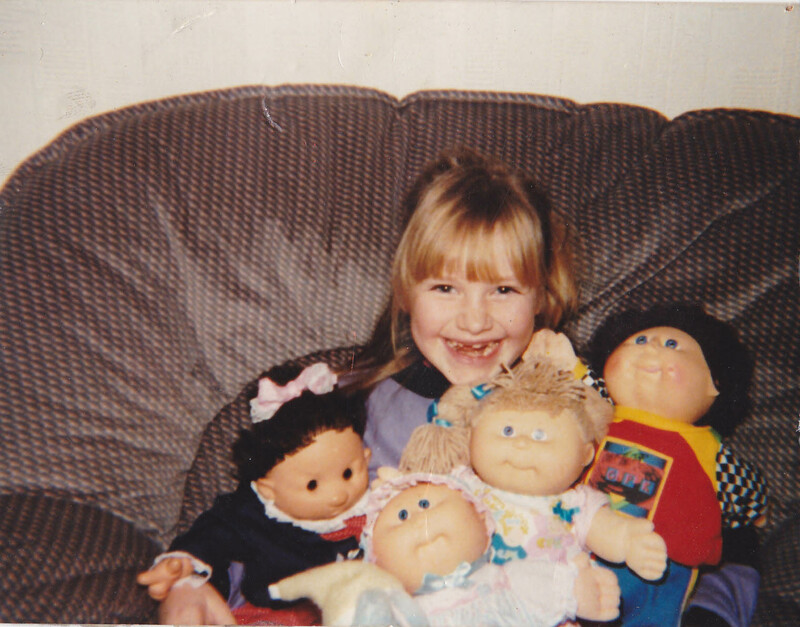 So since I was around 7 years old I have been collecting the amazingly cute Cabbage Patch Kids dolls. (They are cute not creepy) This was in 1990 so I was around 7 years later than the massive craze of when they first came out in 1983 and available for adoption. 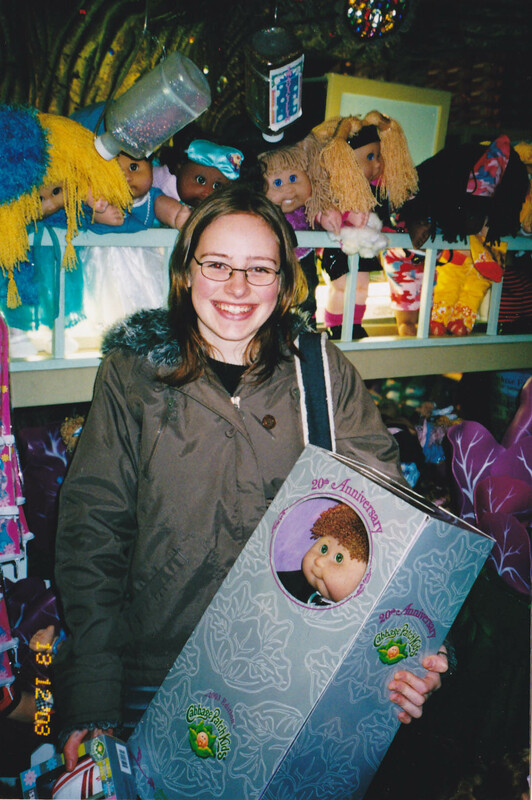 I had decided I wanted one of these dolls for Christmas that year and remember being in Bolton town centre’s ‘Toymaster’ with my mum picking one out. The lucky winner to come home with me that Christmas was Joel. He was one of the big kids with his curly brown hair and trendy tracksuit. Trainers of course included. I was so excited to get to open his box on Christmas day and finally play with him. The biggest surprise of that year was when I got to my grandparents and found that I also had a Cabbage Patch baby as well to play with. This is were we are introduced to Della. In girly baby blue and pink bonnet and outfit she had a what some may say a gormless look on her face. All of what I remember is removing her bonnet and saying ‘She’s bald’. But from there grew both my love for Della and my collection of dolls. A trip to New York saw me purchase the special 10th anniversary edition Prom king style kid in his tuxedo. Another trip to New York saw me adopt the ‘Toys R Us’ special edition where I actually had to carry out the adoption oath in front of the ‘witness’. Luckily it was just my mum and the guy who worked there. My collection got to around 200, not including all the little accessories that went along with them. I have since curbed the buying of the new cabbage patch dolls though my hubby has indulged me in a couple of special dolls whilst we’ve been together. Throughout the years though I have always had my favourite ( I know your not supposed to pick a favourite kid but…) Della Sylvie. She was one of the ultimate originals and from then she has been pretty much been everywhere with me including University, every holiday including around the world to Australia and New York. We did leave her at home when we went on honeymoon though she did have pride of place at the wedding. I hope that when I finally have a little girl of my own she will continue the love of the dolls and play with those handed down to her. But as for Della she will always be mine. 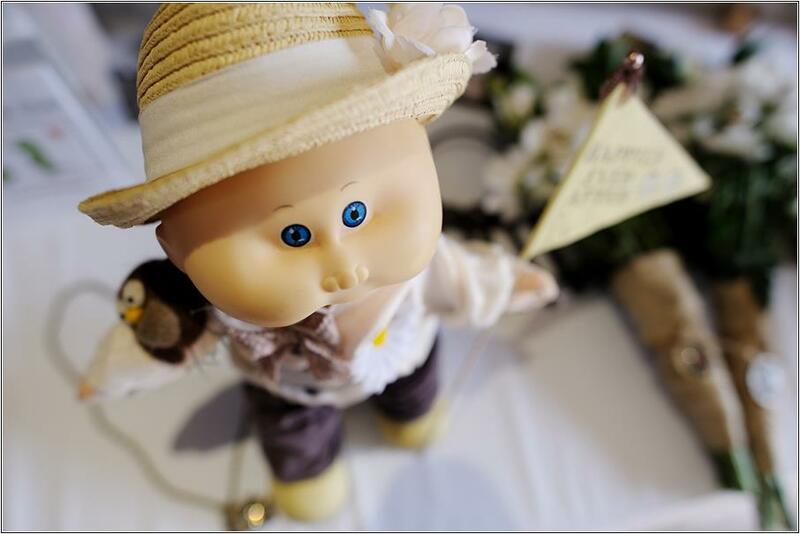 This entry was tagged australia, cabbage patch doll, cabbage patch kids, CPK, cute doll alert, New York, smile, switzerland, wedding. Bookmark the permalink.